I know I just hit you with book 2 in The Perseid Collapse Series, but I have one more offering that should interest some of you. First Contact. Let me explain. Blake Crouch, a talented author I’ve admired for years, asked me to write a novella based on his runaway hit series, Wayward Pines. If you haven’t heard of Blake Crouch or Wayward Pines, you’re in for a treat. Part apocalyptic and horror—all thriller, Crouch’s thought provoking series is unforgettable. I can’t recommend the series highly enough. 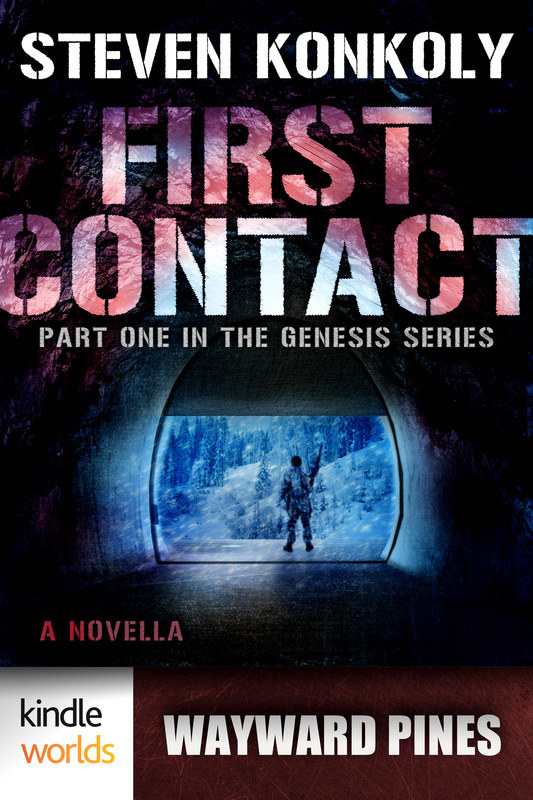 First Contact is a prequel to his series, and unfortunately contains some spoilers that would ruin the unbelievable, mind-bending twist that unfolds in Crouch’s books. Even the Amazon description of my book might undermine the twist. Seriously, the ending to book one in Crouch’s series is THAT GOOD! This is a great opportunity to discover a series that has created an incredible amount of buzz in the book writing world and Hollywood. The Wayward Pines series was picked up by the FOX television network to be a miniseries staring Matt Dillon and Juliette Lewis. Executive produced by M. Night Shyamalan, the series has been filmed and will likely air this fall. My first Blake Crouch book was “Desert Places” (Andrew Z. Thomas / Luther Kite). This was followed by “Run” and then “Pines”. Looking forward to getting back to more of Mr Crouch’s works. He sure reminds me of Stephen King with a unique twist. You’re pretty brave to admit you read Desert Places. Have you read the entire trilogy with the alternate endings? INSANELY GOOD. Twisted, but good. You’re right. I think spell check did that to me. Probably not. Just started typing and presto! New cast for the show. Thanks for keeping me in check. Any idea why I’m not allowed to read this in the UK? Sadly, Kindle Worlds titles have not been opened to amazon.uk. No idea why this is the case, but I do know that they are well aware that there is a high demand for these novellas in the UK. Sorry for the inconvenience, Marcus. Who knows if anyone will see this… But I would love to read your series, as I love the Wayward series, bit Kindle World’s is shut down. Is there anyway or amywhere to purchase/access this series?